The chines are cut into land that boasts important national and local environmental designations. All of the south west coast falls within the Area of Outstanding Natural beauty (AONB) and the Tennyson Heritage Coast. The chine cliffs and shoreline are almost all designated as Special Areas of Conservation (SAC) a European conservation designation and as Sites of Special Scientific Interest under UK law. The few stretches that lie between these protections have been classified as Sites of Importance for Nature Conservation. The natural processes that shape and reshape the Island’s soft cliffs and chines create specialist habitats and niches characterised by the strong, salt-laden prevailing winds; unstable, eroding ground and numerous springs, pools and streams. The plants, animals and birds that have chosen to make these places their homes are living in extreme conditions. 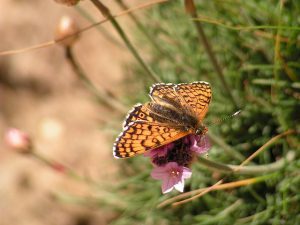 Famously these cliffs are the only native British home of the Glanville fritillary, a small brown and orange butterfly which can be seen in May and June. The caterpillar, with its distinctive red head and black body, feeds on ribwort plantain, a plant adapted to living on slipping soft cliffs. The Glanville fritillary is an indicator that this is a superb site for other invertebrates; over 121 species of ants, bees and wasps also make their home on these cliffs. Some range widely over the cliffs and chines whilst others are restricted to very particular locations including the shelter and warmth of the chines themselves. Over a hundred species of bees and wasps (tiny burrowing varieties – nothing to fear!) can be found here along with unusual minibeasts such as moss-eating Cepero’s ground hopper and the tawny cockroach. 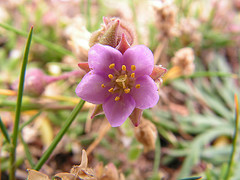 Many of the plants of these habitats are tough, low-growing species that have adapted to clinging to the cliffs wherever they can sustain a foothold. The bright yellow flowers of coltsfoot spread out across the barest slopes in the early spring and the pink rock sea spurrey follows later in the summer along the lip and ledges of the eroding cliff. Elsewhere watercress fills the streams which cut the chines. This plant grows in clear water and used to be collected by local villagers to add variety to their diet. It should not be confused with fool’s watercress which often grows with it but tastes horrible! At Ladder Chine, onshore winds blow sand up from the face of the cliff and deposit it on the cliff top above. It then settles in small hummocks or dunes which become colonised by sand sedges and are mined by rabbits. These unusual cliff top sand dunes can be seen from the coastal path. Shanklin Chine is an especially deep, densely wooded chine on the east coast. Beneath the tree canopy, the cool and humid environment provides ideal conditions for ferns, mosses and their relatives, the liverworts. Shanklin is an important example of a carefully designed, ornamental Victorian landscape. The Island’s soft cliffs and chines supporting a bewildering variety of wildflowers because of the complex geology of the cliffs. There are wetland, chalk grassland, acid heathland and maritime plant communities jumbled and interlocked and constantly changing creating a unique array of food, forage and shelter for the rare invertebrates for which the Island is so renowned. There is considerable conservation effort underway to encourage the natural development and retreat of these habitats from the cliff tops to the farmed hinterland. For example there is now an extensive cliff top buffer zone between the soft cliff and the first cropped fields that will prevent the flower-rich cliff top displays from being squeezed out between the plough and the sea. A wide variety of birds use the cliff tops to nest, feed and shelter throughout the year. In the spring the chines are often the first landfall for long-distance migrants returning to the UK from sub-Saharan Africa; warblers, flycatchers, wheatears and other songbirds can all be found there in March and April. Farmland birds many of which are declining alarmingly in the UK can still be found in the field margins and hedgerows along the south coast, species such as grey partridge, skylark, yellowhammer, and linnet all breed here through the summer months. Autumn is another good time for birding as migrants from across the UK head south and use the chines as a last feeding station before the sea crossing. Birds of prey will circle over the Island using thermals to gain essential height for the long journey ahead. Honey buzzards, and marsh harriers are two impressive species to look out for. In the winter wading birds such as lapwing and golden plover from the estuaries to the north gather in the fields along the chine coast and large flocks of seed-eating finches and buntings search for leftovers in the stubble. Amongst the slumped sea-cliffs there are ledges and hollows where water collects and creates good spawning grounds for frogs, toads and newts. After spending the winter in hibernation they come back to breed, the unstable nature of the cliffs means that the same pond is not always there but, by the same token, the processes that destroy ponds in one place will create them elsewhere. Brown hares are a familiar site in the fields that border the chines and soft cliffs. This is another animal that has suffered declines in many parts of the country but here on the Island it is doing well. The hare is adapted to living with mixed farming where the combination of livestock and arable provides the food and open spaces they need as well as shelter in scrub and low hedgerows. There is a common belief that the origin of the name Whale Chine refers to a large whale having been stranded there at one time. In fact, the origin of the name is more likely to come from the local Wavell (pronounced wa-ull) family who owned the nearby Atherfield Farm between 1557 and 1636. Even so, there have been three strandings of whales and at least ten of dolphins on the beaches of Chale Bay. The largest animal to have reached the Island’s shores in modern times was an eighty foot (24.4m) rorqual whale in 1844.